According to a joint study conducted by the University of California and University of Wisconsin, nearly 60% of all purchases are impulse buys. If you are already on a tight budget, these urges can be a killer to your bank account. 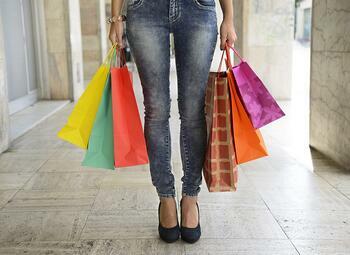 Here are a few tips to help you curb your spontaneous shopping urges. Before going shopping, make a list of everything you need and the stores where they can be found. Since you know everything you need to buy and where you need to go, you can prevent random wandering past items you don’t need in stores you don’t need to visit. Before non-essential purchases (AKA anything you and your family don’t need to survive), give yourself at least 48 hours to think about what you are wanting to buy. Do you really need it? Will you use it? Would you be interested if it wasn’t on sale? Etc. You can usually talk yourself out of those little splurges after a few days. We all have things stored in our closets that we have forgotten about. So when the feeling of needing to purchase a new dress or a pair of shoes hits you, take a look at what you already own. Use magazines and sites like Pinterest to look for ideas to help reinvent outfits or create new pairings. It is psychologically harder for people to spend when they are using cash. If you write out what you are planning to buy and only bring enough cash to make your purchase, that temptation to toss a few extra things in your cart will disappear because you don’t have enough cash for them. Being able to make purchases from the comfort & convenience of your home (and your pajamas) has made online shopping a mainstay in many of our lives. However, if you are trying to cut out impulse buys, this can be one of the most difficult things to eliminate. Unsubscribe from emails alerting you about sales, if you don’t know about them, you’re less likely to be tempted. Delete your stored credit card information from all websites you frequent to help eliminate the enticement.